If you notice the filling fall out and it's still in your mouth, you should immediately spit it out to avoid swallowing it or breathing it in. 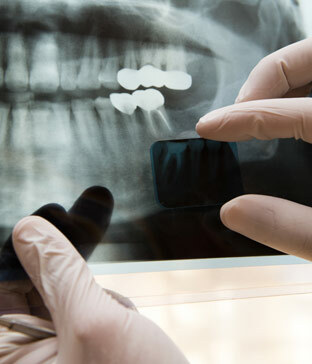 Once you are sure that the filling or any broken pieces are no longer in your mouth, call your dentist and book an appointment to have the tooth looked at and the filling replaced. If you need to wait more than a day to see your dentist, it's vital to keep the tooth and the hole left by the filling very clean to prevent infection. Avoid eating sticky foods and take care to brush around and in the hole in your tooth to remove all food debris. You can help keep the area clean by rinsing your mouth with a solution of warm water and salt. Mix one teaspoon of salt with one cup of warm (not hot) water and rinse for 30 seconds. If you feel pain or sensitivity around the area where you lost the filling, you can try over-the-counter pain medication. Alternatively, you can try putting a piece of chewed sugar-free gum in the hole left by the lost filling. This will cover and protect the sensitive exposed tissue in your tooth. If the crown breaks off, ensure that none of the pieces of the crown remain in your mouth. A lost crown is not usually a medical emergency, but the exposed part of your tooth might be very sensitive to the air or hot and cold temperatures. If you lose a crown, contact your dentist right away to book an appointment. It may be possible to place a temporary crown until a permanent one can be prepared for you. Because crowns support the teeth on either side, you don't want to wait too long to replace one. Left too long, the adjacent teeth can begin to lean into the gap left by the missing crown, making it difficult to replace it. If the crown has just fallen off its post, you may be able to slip it back onto your tooth. It can be held in place temporarily with denture adhesive. Don't use any other adhesive in your mouth as they may be toxic. Sensitivity could be caused by a variety of factors, including tooth decay, exposed roots due to receding gums, a loose filling or other causes. You can reduce sensitivity by using a soft toothbrush and toothpaste made for sensitive teeth. If the sensitivity continues for several weeks, or if it worsens, see your dentist. Lingering pain after eating hot or cold foods could be a sign of a diseased or damaged pulp. If this is happening to you, see your dentist to have the tooth checked. Your sinuses and upper back teeth share the same nerves, and pain in one area can often be felt in the other. That's why your teeth sometimes hurt if you have a bad cold. If pain in this area is persistent or becoming worse, see your dentist to rule out any dental causes. You may also need to see your family doctor to diagnose the pain in your sinuses. These symptoms are associated with an infection or abscess that has spread from a tooth into your gum tissue. If you experience these symptoms, call your dentist immediately for an examination. Over the counter painkillers will reduce the pain until you can be treated. If the swelling or pain becomes worse, or you notice swelling around your jaw or eye, go to the emergency room immediately. These examples cover the common causes of pain and inflammation in the teeth, mouth and gums, but they are not a full list. If you suffer from any of these symptoms, or if you've suffered an injury to your teeth, gums or jaw, don't hesitate to contact us to book an emergency appointment.